THE ENVALVE IS HERE AND SAVING MY READERS LOTS OF MONEY BY KEEPING THEIR ENGINES CLEAN, CLEANING UP YOUR EXHAUST (FAILED EMISSIONS TEST??) AND STOPPING OIL LEAKS!! CLICK HERE TO LEARN ABOUT THIS SIMPLE YET EFFECTIVE DEVICE THAT REPLACES YOUR PCV VALVE IN LESS THAN 15 MINUTES (INCLUDING TIME TO WASH YOUR HANDS!! The Load Handler is now available from Misterfixit. 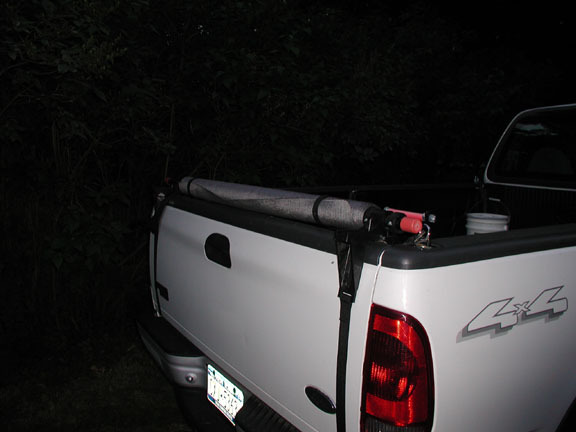 If you have a pick-up truck and use it to haul any bulky items such as top-soil, gravel, bags of fertilizer or anything you don't want to unload by hand then this device is for you. For less than a hundred dollars you can make the back-breaking work of unloading "stuff" from your pickup by hand a 30 second job. Click on the picture and you will be able to order one from me. Read about the author and how we got to this point in autorepair remote diagnostics or Go directly to the meat . . . The concept of being able to remotely analyze a car owners problems is nearly impossible, however I have been successful in diagnosing a variety of symptoms over the net in the past years. What I can do is to help a car owner to understand what "might" be wrong given a set of symptoms. Better yet, I can help a car owner to make a decision as to whether or not to allow an auto repair shop to make their recommended repairs. Given a set of symptoms and a repair shops estimate of the proposed repairs it is a reasonable task to supply the unwary car owner with information they can use as ammunition when returning to the shop for the repairs. There is nothing better than to be armed with knowledge when confronting a shop owner or mechanic who is proposing a given repair. For example, if a shop tells an owner that the alternator needs to be replaced a car owner might just ask what the voltage across the battery measured at 2000 RPM with the accessories turned on. The shop owner is immediately put on notice that this customer is knowledgeable and is less likely to suggest repairs that are unnecessary. Perhaps just cleaning the battery terminals or adding water to the battery is all that was needed. Soooo, that's why I have decided to generate this web site. Here you will find all sorts of information regarding auto repairs, their symptoms and enough information about the repair and fault to arm the car owner and prepare him/her to meet the enemy (not always the enemy, there are a lot of honest shops out there) ! The page will eventually be organized by general category: electrical systems, fuel systems, exhaust systems etc. Just click on the part which the mechanic has suggested to be replaced and you will be taken on a journey as far abroad as you wish. The first level will give you general knowledge, enough to talk your way around a service writer. The next level will prepare you to talk with a mechanic who will actually be doing the repairs. After that you can continue to explore the theory as deeply as you want! You may even be able to do the repair yourself, although this is not always the object of this adventure. Increasing your knowledge is the main thrust. If you have friends who are knowledgeable but far away from your home then you could always use some conference call services to get them on the phone to help answer your auto repair questions. But for now, until I get organized and do everything I want to do, sit back and read some of the tales of auto repairs past that I have personally experienced. Perhaps there are some lessons to be learned by just reading and enjoying my anecdotal tales. Here is the section mentioned above. It contains stories from readers who want to share their experiences with others to save them time and money. Josh has a few stories about low oil pressure, a stalling engine and an engine vibration problem. Mustang Carburetor Problem - reader contribution concerning an idling problem. More information about removing a GM rack and pinion from a reader. Here's a possible scam for you Pinto and Vega owners. The saga of an 85 Ford pick-up that kept dying. Here's a tip for making water pump replacement an easier task - it is on a Chevy Blazer but it will work well on most water pump installs. Rough idle on a Jeep Cherokee - problem and solution. Another Idle Air Control story - this time it's a Ford Taurus. Yet another one on a 94 Taurus Idle problem. Just when you thought you knew all about fuel system diagnostics and solutions to their problems - along comes this story. Take some of the mess out of an oil and filter change. For all of you Ford Explorer owners out there here is a FAQ for you. It is about 80K of text. The best way to use it is to use the browser's "Find Tool" and enter a word on the topic you choose. Here's a quick story about a Jeep Cherokee that refused to start. Diagnosing a weird beeping noise from a Tempo. Beep beep. The Plymouth refused to start and the owner refused to give up. So, what does a heater motor have to do with a no-start condition. Read this story and find out. You go through a box full of parts and it still isn't running - so, what did you forget?? Read on to find out about a critical part which is almost always overlooked. One reader discovered the bad part on his own. Go here. Here's a good story with a lot of messages. An Isuzu Rodeo is running rough and it seems to happen when you hit a bump in the road? Find out why. A Volvo 740 Turbo can't get out of its own way. Here is a solution that may have never been found at a shop, or might have been discovered after a thousand dollars worth of parts had been tossed under the hood. Here's a short story about a clever way to foil a wheel thief. A tip from a reader tells how to diagnose a fuse blowing problem. A technician tells about a stalling problem that wound up being caused by the transmission. A failed cooling fan on a 92 Chev Lumina caused this reader some headaches. 93 Oldsmobile Ciera has an air conditioning problem you should know about. They sold this reader a transmission overhaul and it really needed a speedometer cable. A reader persists with the Ford Motor Company and has her problem solved. A strange noise in the engine baffles a bunch of mechanics - all except one. Here's a mailnote from an irate mechanic who believes that we should leave the mechanicing to the mechanics. He also has some warnings for the inexperienced backyard mechanic so read it and use whatever information you feel is valuable to you. Don't always look for a problem on the "hot" side. This problem with a wiper motor had a negative slant to the solution. A reader has an intermittent problem with a stalling and no start condition on a Taurus. A reader describes his experiences with oil leaks from the Cadillac Northstar engine. A reader describes his battle with a bad wire on alternator of a 1972 Olds Cutlass. This car wouldn't start after washing the engine with Gunk. Find out why. Here's a story from a reader about a problem with hard starting and fuel tank woes on Ford F250s. Here's a tip that won't save you time and money but it's worth reading because it may save something even more precious. A shop owner takes issue with my attitude towards auto repair shops. Here is his letter. A Crankshaft Sensor on a 90 Chevy Celebrity goes south. Rebuilding your engine?? Here's something to think about!! Replace a collapsed gas tank? Why? When you can use this trick. Yet another story about the infamous Buick Timing gear problems. What's that funny Noise, Bob? Magnets, magnets, magnets. Here's a tale about broken spark plugs and how to prevent problems in the future. Here's some interesting stuff about an Australian Volkswagen (VW). Some problems are caused by the strangest things. Read Ed's story about a car stereo. Here you will find tips on making the job a little bit easier. Not necessarily in any order, just as I think of them or readers send them to me. Here are a few tips for you to use around the shop. I put this article here cuz I couldn't figure out where else to put it. Ford Truck won't start. Here's a way to find out why your compression is low in one or more cylinders. YOU SUSPECT THAT THE TIMING GEARS ARE WORN AND THE CHAIN IS STRETCHED BUT YOU AREN'T SURE. HERE IS A SIMPLE WAY TO CHECK FOR A LOOSE CHAIN WITHOUT REMOVING THE TIMING GEAR HOUSING. IT'S A REAL TIME SAVER!! No lights, no horn, no radio, no start - NO JUICE!! Can't remove that crankshaft damper pulley bolt because the engine turns over? Try this trick. Ever have an electrical short that was so bad that it blew fuses instantly? Here's a way to diagnose that short circuit without emptying your wallet buying fuses. A reader describes what can happen when a loose connection causes a high resistance which in turn generates sufficient heat to melt the plastic on a fuse. A Ford mechanic tells how to get at that failed truck fuel pump the easy way. Look here if you have a Datsun and want some information or help from the club. A 81 Datsun 200 SX intermittent performance problems is traced to a faulty ignition module. An 89 Mustang's - starting problems is traced to a flaky inertia switch. Low compression in one or more cylinders can be caused by many possible failure modes. Here's a diagnostic procedure to isolate the culprit. Remote control doesn't work? Dropped it lately, who hasn't? Read all about the problem and how to fix it or have it fixed. Pump your own gasoline - why not? Some states allow drivers to pump their own gas and save money. Here's an entertaining story that demonstrates how to do it. Why are my windows all fogged up on the inside?? What's going on?? Flat tire?? Here's a brief outline how to change one. Vehicle Identification Numbers (VIN) explained. Want to know for sure what year that used car is?? Go to this page and see how to determine that as well as other details. Links - here is a page that has more automotive links than you will ever need. Check it out! Here's a link to the Chevy Beretta website. Automobile Keyless Entry Systems can ensure your immediate access to your vehicle in darkened parking lots and other areas where you don't want to waste time fumbling with keys. Here's a story about a lost remote control and how I fixed the problem. The Ford F150 with truly intermittent wipers. My heater controls go bonkers when I step down on the gas pedal and my cruise control stops working. What's wrong?? Cruise control systems - how they work and what fails. Air Conditioning - How does it work?? A 92 Pontiac Bonneville SSE refuses to supply the correct amount of airflow from the air conditioning system. The solution? Don't sweat it - it was simple! A 2000 F150 heater runs on high speed only. Do I need a new switch? Motor??? Read this article and find out. So, you think you have a bad alternator?? Before you spring for the bucks, go here to make sure you are spending your money wisely. Alternators - what they are, what they do and how they fail. For a good description of the charging system in most modern cars go to the Charging Page. Here's a tale from a reader about a parasitic drain on a battery that was driving him up a wall. Bill has documented his experience with an alternator so that you don't have to go through the same pain that he did. A broken connector causes headaches and $$$ for this reader. Bad Battery? Maybe so. Read this first. A battery is rated at 500 CCA or Cold Cranking Amps - what does it mean? The battery rating is at 0 degrees F so how many CCA do I have if the temp is -30F?? For a listing of all the terms you will ever need about batteries go here. A reader describes problems with "Tough One" batteries. If you have one read this article. Snowmobiles can be started with a pull of the rope but why not just replace the dead battery in your snow machine!! An excellent series of articles on how brakes function can be found here. Here's a tip on adjusting the rear brakes on a Miata. Installing a new master cylinder requires a bench bleed to ensure all the air is removed from the unit. I installed brake pads on my 2000 Buick LeSabre and have a few hints for you to make it easier. Here's a tip for removing the pilot bearing when doing a clutch replacement. Here's a link to those mysterious MoPar (Dodge, Chrysler, Plymouth) computer codes. A 90 Pontiac drives one of my readers nuts with drivability problems. Here's his solution. A Code 44 indicates a lean mixture on a GM product. Go here to see what can cause this code to be set. A Code 45 indicates a rich mixture on a GM product. Go here to see what can cause this code to be set. Want to find out how to read the stored fault codes in your 1996 Nissan? Here a reader tells all. OBD II is a standard diagnostic system required of all cars manufactured after 1996. Here is the home page of the OBD II diagnostics center. A Pontiac exhibits some bizarre behavior and it looks like a flaky computer. Engine running cold? Heater blowing cold air? It's time to replace the thermostat. So you think you have a blown head gasket? Read this article to see if you do. Overheating while driving slowly or idling is usually a problem with the cooling fan. Look here to find out what to check. Next time you need a new radiator go here for a fantastic on-line company who offers a new radiator with a lifetime guarantee!! DETONATION AND PRE-IGNITION can cause major damage to your engine. Here is an excellent article written by the Fel-Pro gasket company. MisterFixit says "Check it out!" Check here if you are interested in a scan tool to read the codes on your OBDII compliant engine computer (ECM) - OBDII systems were mandated to be in all USA automobiles built since 1996, not for 400 or 500 dollars but for under $100. Check out these suggestions from a diesel expert. Bad ground connections can be just as troublesome as bad "hot" connections. Here's a situation where the bad ground caused a hot problem of another sort. A problem with a bad wire drove Otto and me nuts for a few hours. Ford Truck won't start. A reader finds the cause of blowing fuses in his alternator circuit. What's that oil in my air cleaner?? What's a PCV Valve? What is blow by?? A description of the PCV system , how it works and how it fails. Catalytic converters - Colorado State University discusses the emissions standards and how they relate to functional/failed cats. Also, here is a good link to the same University's test labs with a few good anecdotal stories about emission control device failures. Catalytic Converters - an excellent description of what they are and how they work. A cut-away picture of a catalytic converter. Car can't get out of its own way? Clogged Catalytic Converter? Go here to see how to find out. More good info on cats - go here. Analyzing and finding engine "knocks"
Here's a story for any would-be engine overhaul mechanics. No matter how careful you are you can always make a bad assumption. Here's a story from a reader with fuel problems on his 94 Blazer. So what is this phenomenon called "vapor lock" and do I have it?? 99.9% of all modern engines use an electric fuel pump which is located in the fuel tank. Read this article to see how an engine can still run even though the fuel pump relay is fried. An 88 Ford Tempo idles poorly until this reader serviced the IAC solenoid. A Lincoln dies and won't start. Here's a solution that most won't think of. A minor accident causes this Fiero to not start. Read this weird reason why. The Studebaker with a mind of its own. Stalling after five minutes of running in cold damp weather is a problem. Here is one possible solution. Here's another reference to fuel injection - General Motors Fuel Injection: Port Injection and Tuned Port Injection. Another link to a fuel injection page hosted at Ohio State University. Fuel Injection for the DIYer. What happens when a car won't start in wet weather or stalls out when you hit a big puddle. Read about wet ignition, the secret is in the sauce!!. Ever remove the distributor and then have a difficult time getting it back in the right position again? Here's a way to install it properly. A Beretta Quad-4 has performance problems. Changing the ignition cover helped but the problem soon returned. More info on diagnosing a failing High Voltage ignition problem. A 1987 Mazda has problems with acceleration. Here's how a reader fixed the problem. The Ford Truck that bucked when the headlights were turned on! Another cruise control drops out randomly. Find out how this reader fixed it. This story is about a boat ignition system but the lesson learned is applicable to cars so I wrote it and included it on this page. Paint problems on General Motors vehicles. Looking for car parts and accessories at a good price? Look no further. Click the banner to get an instant quote on even the hardest parts to locate! Any parts you buy there helps keep this website afloat so buy often!!! RESTORING A 1957 FORD? OR ANY OTHER VINTAGE CAR? CAN'T FIND PARTS FOR THAT BUGGY? CLICK ON THE TAIL LIGHT BELOW AND MAKE IT EASY ON YOURSELF TO FIND JUST ABOUT ANY PART FOR ANY VINTAGE CAR! Ever since I was a kid I found great joy looking through the JCWhitney catalog. I ordered more hot rod stuff from these folks than I can remember. Now they are sponsoring my website!! Neat, huh? So visit these kind people and buy all that good stuff they have to offer. Sure I get a small cut but you won't see it in the price you pay. Just helps keep me going here!! So click on their banner asd order something for Pete's sake!! Problems with poor cold weather performance. More information on dieseling here. New vehicle? Lots of rattling and clanking when the engine is cold? Read why in this article.. Loose steering can cause a dangerous driving condition and may lead to a serious accident due to loss of control. Here's what to check for. Here's an interesting problem from a 96 Ford Taurus owner who can't steer when it's raining!! Temperature gauge running on the high side? Read this before spending any money. Time to flush the cooling system. Here's an article with a few tips on how to do it the right way. Here's a tip from a reader on how to prevent failure of crossflow radiators. Curious about the circuit for a starter system? Here are some good schematics layout showing where the current flows when you turn the key. Another link on causes of tire wear. Another site with information about wheel alignment. To order trailer hitches, electric brakes, and for lots of good information regarding installing the latest electric brakes visit the site for etrailer below. Just click on their name. For a description of the converter lock-up feature on so many transmissions, look here. More information on TCC problems can be found here. . . . and here. This 93 Ford Explorer's transmission was late shifting our of first gear when it was cold. Read how to fix the problem and how to beat the bad guys who want to take your hard earned money when the work isn't necessary. Driveline Clunk is a noise that occurs when you go over a dip in a road or start up at a light after a sudden stop. Here is an explanation as to what causes it and how to cure it. Renault Fuego transmission problems aren't always transmission problems. Here's a link to the Renault Fuego Club. Here's a story from a reader about a 92 Mazda Navaho standard transmission that leaked all its fluid with no signs of leaks on the driveway. Find out where the stuff went by going here. Factory original manuals and literature at DISCOUNT prices! BOOKS ABOUT AUTO AND HOME REPAIR FROM AMAZON DOT COM. GO HERE TO LOCATE BOOKS YOU NEED TO DO YOUR REPAIRS THE RIGHT WAY! LOOK HERE FOR THE NAME OF THE SHOP NEAREST YOU THAT COMES HIGHLY RECOMMENDED BY ONE OR MORE OF OUR READERS. AS WITH ALL RECOMMENDATIONS FROM READERS, THEY ARE THE READERS OPINIONS AND NOT NECESSARILY THAT OF Mister Fixit. For as many years as I can remember I have always been an avid reader of Popular Mechanics, a magazine that brought me tips and tricks of the trade as well as many other valuable and informative articles all about cars. Now you can read the magazine on-line! Just click here to go to one of the most informative pages on automotive repair!! CAN'T FIND EXACTLY WHAT YOU ARE LOOKING FOR ON MY AUTO REPAIR WEBSITE?? USE THIS TOOL TO SEARCH FOR KEY WORDS ON MY WEBSITE! !